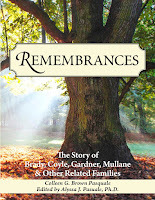 Every discovery hinges on the one before and several things came together recently to help me to learn more about Daniel Mullane, my great great grandfather. 1. 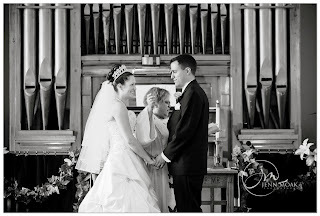 Daniel Mullane married Brigid English. They had several children and lived in Clonmel, Co Tipperary, Ireland. I knew this from family stories, letters, photographs and the 1901 & 1911 Irish Census Records. 2. Daniel’s father was Thomas Mullane, carpenter. This information came from his 1866 marriage record. 3. Daniel Mullane was born in County Cork, c, 1838. This came from the 1901 & 1911 Census information. 4. Daniel was Roman Catholic. Sources for this include family stories and the 1911 Census. Recently I contacted the Archivist at the South Tipperary County Archives. She kindly found and sent to me the obituary for Daniel. (See May 20 post with details). This obituary gave his birth as Kanturk, Co Cork. That was one more detail I needed. I went to www.rootsireland.ie and put in the information I knew: Daniel Mullane bc 1838 in Kanturk, Cork, son of Thomas Mullane. Very quickly, I had a match for his Baptism! Church Baptism Record for Daniel Mullane, 25 January 1838, Kanturk, County Cork, Ireland; Mallow Heritage Centre; www.rootsireland.ie. Denomination: Roman Catholic. Parents: Thomas Mullane & Julia Sullivan. Sponsors: James Mullane & Bridget Sullivan. I had verified his birth year and learned his mother’s name! I wanted to see what else I could find out on the same website. I put in the Baptism form with no first name and searched the years before & after Daniel’s birth for children with the same parents. I found two sisters for Daniel. Church Baptism Record for Ellen Mullane, 12 June 1836, Kanturk, County Cork, Ireland; Mallow Heritage Centre; www.rootsireland.ie. Parents: Thomas Mullane & Julia Sullivan. Sponsors: Denis Leary & Mary Sean. Church Baptism Record for Margaret Mullane, 2 January 1840, Kanturk, County Cork, Ireland; Mallow Heritage Centre; www.rootsireland.ie. Parents: Thomas Mullane & Julia Sullivan. Sponsors: Cornelius O Leary & Mary Sullivan. Daniel & Brigid had daughters named after these women. So much just fit together, like putting in that puzzle piece that just slips in the picture. 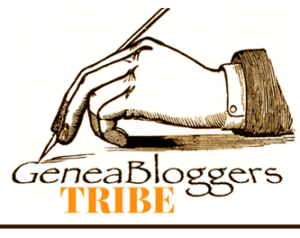 Sepia Saturday provides bloggers with an opportunity to share their history through the medium of photographs. My grand uncle Owen Mark on his farm in Ohio. 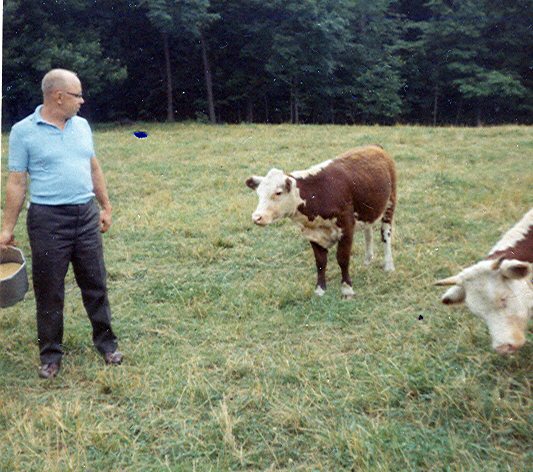 Look at more "moo-ving" photos at Sepia Saturday. 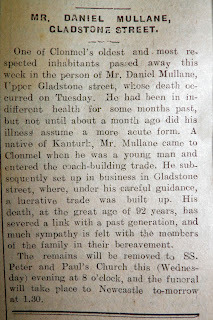 One of Clonmel’s oldest and most respected inhabitants passed away this week in the person of Mr. Daniel Mullane, Upper Gladstone street, whose death occurred on Tuesday. He had been in indifferent health for some months past, but not until about a month ago did his illness assume a more acute form. 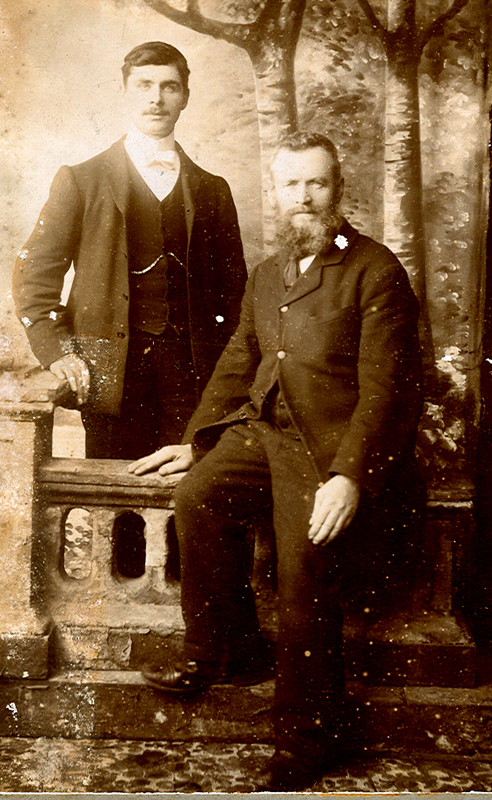 A native of Kanturk, Mr. Mullane came to Clonmel when he was a young man and entered the coach-building trade. He subsequently set up in business in Gladstone street, where, under his careful guidance, a lucrative trade was built up. His death, at the great age of 92 years, has severed a link with a past generation and much sympathy is felt with the members of the family in their bereavement.The remains will be removed to SS. Peter and Paul Church this (Wednesday) evening at 8 o’clock, and the funeral will take place to Newcastle to-morrow at 1:30. During my recent trip to Ireland a gentleman in the National Archives in Dublin suggested I visit the South Tipperary Archives, Carrigeen Business Park, Clonmel. He said I might find voters’ lists and burial records there. The archives is open by appointment only and I missed the opportunity to visit in person. However, I have been in contact with the archivist, Róisín O'Grady B.A., M.Phil., H.Dip.A.S. 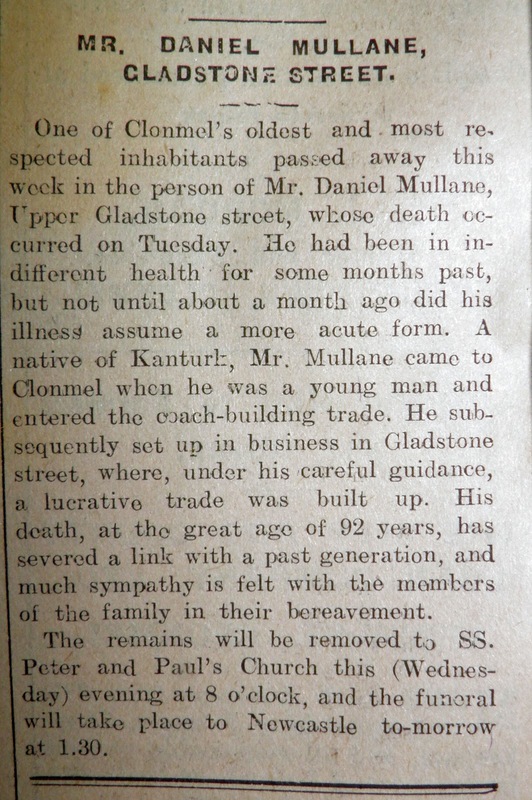 The very first thing she found for me was this obituary for Daniel Mullane, my great – great grandfather. Home again but my trip continues to pay off. 17 May 1841 Thomas Brady & Catherine Gibney. They were married in Ireland. They had nine children, all born in Ireland. Thomas & Catherine were my third great grandparents. 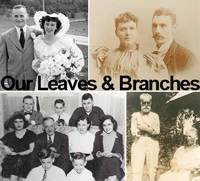 23 May 1912 Floyd Bernard Moore [son of Peter Jonathan Moore & Caroline Louise Gruissy] & Anna Slaby. They had four children, all born in Cleveland, Ohio. Anna died 20 January 1924. 26 May 1933 Robert E. Ballard & Vera Victoria Mark [daughter of Thomas Kenneth Mark & N. Regina Gruissy]. 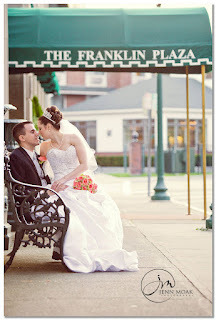 They were married in Medina, Ohio. They had one daughter. Vera died 8 June 1995 in Florida. 28 May 1896 Edwin Mark [son of Abraham Mark & Mary Isabella Heffelfinger] & Delpha. They were married in Wayne Co., Ohio. Edwin died 5 Dec 1920 in Ohio. 31 May 1952 David Walter Foss & Olivia Margaret Shaw [daughter of John Rickert Shaw & Mary Jeanette Mark]. They had one son, born in Ohio. Wedding Wednesday: A brand new wedding! Our son and our daughter-in-law were married on Saturday! Technology is terrific, when it works. I keep my genealogy, my generations of family photographs, my family book-in-progress and many other things on my laptop. I’ve had a Lenovo ThinkPad for about five years. Over those years I had a couple broken keys and my laptop was not very fast any more. I decided to treat myself to a new Lenovo. I passed the old one on to my daughter. Unfortunately, before I could begin to enjoy my new laptop, the hard drive failed. It has been returned to Lenovo, quickly repaired and is on its way back to me. Meanwhile I am learning how much my life has been centered around that machine. All my information is on an external hard drive but I can’t easily access it. I have the ancestry app on my iPad but the app does not give me a link to all my Family Tree Maker 2012 details. I cannot read my ‘Notes’ for individuals. I keep lots of details & sources there. I have new information from my trip to Ireland that I cannot yet add to my records. New posts for my blog are also on hold for now. 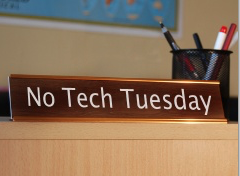 My Tech Tuesday is, sadly, a No Tech Tuesday. Practical Things. Keep these in mind if you plan to travel to Ireland. · A UK power convertor is a great thing to have. It adds a lot of weight to your suitcase but we used it with a power strip, every other night to charge our cell phone & iPads. There are not many outlets in the rooms. You may have to unplug a lamp to plug in the convertor. · An International Driver’s License is not required. AAA had told me it was. · Have Euro coins at the ready for parking [needed most every where] and tolls [needed rarely & just on the main highways which we seldom used]. · Car parks are small & hard to find. We often based our hotel selection on places we could park the car. · Places are difficult to find. They often have just a street & town [no street number] or just a town & county name for an address. Small rural roads seldom have road signs. Update your GPS to include Ireland but don’t expect it to show small rural locations. · Skype or Facetime are great inexpensive ways to stay in touch with home when the internet is available. We had wifi about 75% of the time. · When I told my bank I was going to Ireland they did not include Northern Ireland and my card was refused there. If you are going to both, do better than I did and tell your bank or credit card companies. · My daughter has the book, 1000 places to See Before You Die & it led us to places most tourists don’t see & delicious places to eat. Genealogy. I am not at expert on Irish research but I learned a lot on this trip. · Do all the things you read about such as being prepared by doing as much research here as possible before you go. Have your information with you. A paper copy is best. Don’t count on the internet to be available to see your information. · Know where you are going, as specifically as possible, whether it is a church, library or town. If there are hours to a library or archive, know the hours. · This may sound basic but: Have clear goals in mind. Are you looking for records, such as marriage or death certificates? Locations, such as the town where they lived or a cemetery? Or are you trying to find living relatives? I wanted to find the tombstone in Clonmel for my Mullanes but did not. I did find the Carrick church where my Coyle ancestors were married. · As I traveled I learned how I can search more effectively from home and on my next trip. Ireland, a terrific place to visit! · The people of Ireland were very friendly. We saw smiling faces everywhere we went. A smiling face on the young man walking his dog at the Blarney Castle waterfall who gave us tips on places to visit. A smiling face on the woman on the sidewalk in Clonmel who gave us directions to the archives. A laughing face on the bartender who thought my name [the Irish first name & Italian married name] is ‘dodgy’ [he’s right. Ha!]. A big smile on the woman in the woolen shop who offered us free cups of coffee because it was our first trip to Ireland. Be polite [of course] and praise their country [it is lovely] and you’ll see lots of beautiful smiling faces. · Each part of the country has a unique beauty: green hills, dramatic cliffs, ocean views, majestic mountains, ancient ruins and bustling cities. See as much as you can. Don’t limit yourself to genealogy and library stacks or you’ll miss a lot. · Most of all, enjoy the visit to Ireland! Leaving the Johnston Central Library in Cavan Town with map in hand we headed south east to Kilnaleck. From there we used the map to find the places our Coyle and Brady families had lived and worshipped. We drove up and down the little roads that looked very much like the Irish roads we’d been driving along all around the island. There were green sloping hills and stone walls with scattered trees and sheep. I could have photographed any of those other spots, taken the photos to my family and said, ‘Our family came form here.’ However, I didn’t want any Irish lane, any stone wall or charming church. I wanted to stand where my ancestors had stood. So we drove and turned and doubled back. We wondered if the tractors’ routes counted as lanes and if a modern drive obscured an ancient route. Stopping, starting and turning we did our best to find the exact places we wanted. We found St. Mary’s Church. The church was built c. 1824 when it had a clay floor. Doors, windows and pews were added later. In the early 1840s children of Michael and Mary (Cunningham) Coyle were baptized here. On 11 February 1870 their son, Patrick Coyle married Margaret Brady here. We’d seen grander churches in Ireland but none thrilled me more than seeing the place my great great grandparents had been married. The church was open. I was able to kneel and offer a prayer for the souls of my ancestors and a prayer of thanks for the opportunity to be in that special place. Thomas & Catherine (Gibney) Brady lived in Killykeen. Son, Thomas, was born there in 1860. Catherine died there in 1873. In 1901 & 1911 Thomas was still in Killykeen, living with his son, Patrick, and his family. There were times when the Thomas & Catherine (Gibney) family lived here. We drove through this little cluster of buildings. St. Paul’s Church. Children of Michael & Mary (Cunningham) Coyle were baptized here. The church and church yard were locked up. I was able to peek at it over the stone wall. There were times when the Patrick and Margaret (Brady) family lived here. Their oldest child, my great grandfather, Michael Coyle was born here in 1870. I very much wanted to find Moat. My daughter and I studied the map carefully and made a left off R194 along Lough Sheelin hoping it was Moat. We passed three or four houses without any indication of the name of the road. When the road became narrow my daughter turned out little rental car around and went back up the road. I asked her to pull to the side of the road at the first house where I had spotted a man in his driveway, w orking on his car. His little white terrier ran over to warn me off with his barks. His owner soon calmed him and the little dog sat and watched us talk. “Hello. I am looking for directions. I’m trying to find the place my ancestors lived. Is this Moat?’ He shook his head but was very friendly, looking carefully at my map. He was from Belfast and hadn’t lived there long but he loved history. The road I wanted was another mile up the road. He also advised me to go up the road to Ballynarry post office and shop to find a book on the history of the area. Concepta, at the Johnston Central Library, had suggested the same book on the history of the area. With much thanks to this gentleman I got back into our car. Back at home, when I search the internet or looked through reels of microfilm and saw references to Moat, I pictured a cluster of little houses. Records call it a townland but in reality it is an easily missed country lane. The end of the road is blocked by a gate and the couple houses there are very new. Any sign of the former cottages is gone. There is piece of an old wall and a low, abandoned stone structure. It was not a place I could feel any connection to my family’s past. We made one last stop in County Cavan. We doubled back on R194 and turned left to find Ballynarry. The post office and shop turned out to be the same building. A small red haired lady greeted us and I told her I was hoping to find a book on the history of Ballymachugh and Drumulumman South. She knew the book I was looking for but didn’t know where it was. She went off to make a phone call to help her find it. My daughter and I glanced around the little shop with shelves of food and household supplies and pencils and school notebooks. I looked up over my head and spotted a shelf with three copies of the book. Helen, the clerk, announced her surprise at my spotting the book as she brought over a wooden chair which she hopped right on and grabbed the book. She did not know what to charge for the book. She went to the back once again to make a couple calls to track down the owner of the shop and learn the price. 30 Euros, would that be alright? It was the exact amount of Euros I still had in my bag. Perfect. Since I have been home and have had time to read the book closely, I have discovered it is a treasure, filled with the history of the area my family lived. The day was getting late and we were exhausted from our long days in Ireland. My daughter turned the car towards the highway and Dublin. May 1836 Frederick Miller & Barbary Ritter [daughter of Johannes Ritter, Jr. & Anna Mariah] Frederick & Barbary had five children, all born in Ohio. Barbary died 12 Feb 1895. 1 May 1851 John Shaffer Ellzey, Jr. [ son of John Ellzey & Elizabeth Coney} & Saryntha A. Smith [daughter of Wyatt Smith & Euseba Fortenberry] John & Saryntha had eight children, all born in Mississippi. John died 5 Sept 1874. Saryntha died 25 July 1905. 1 May 1919 John William Ritter [son of Isaac Ritter & Isabell Fisher] & Minnie J. Marshman. John William Ritter was married three times. He also married Ruth Anna Scott & Mary E. Cobler. He & Ruth had eight children, all born in Ohio. 6 May 1917 Frank Pascale [son of Augustino Pascale & Maria Grazia Servello] & Giovanna Pascale [daughter of Thomas Pascale & Carmella Arena]. They were married in Mt. Kisco, NY. They had six children. 6 May 1939 Sammuel Ruffus Brock & Iris Elizabeth Pierce [daughter of Arlie Pierce & Lyda Mearl Brown]. They were married in McComb, Pike, Mississippi. They had two children. Sammuel died 5 Dec 1989 in Mississippi. 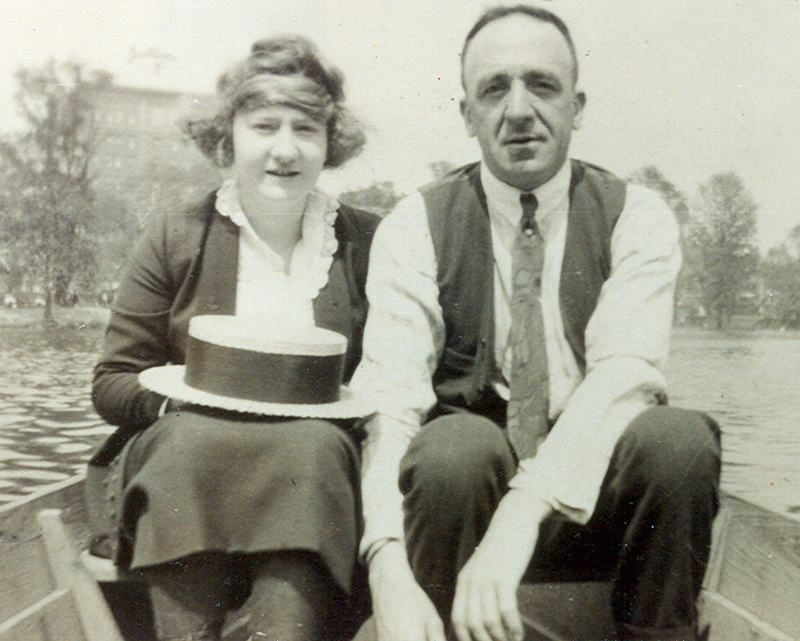 7 May 1912 James Joseph Coyle [ son of Patrick Coyle & Margaret Brady] & Madeline Herbst [daughter of Conrad Herbst & Rosa Hahn] They were married in New York, NY. They had seven children. The oldest was born in Texas and the others were born in Connecticut. 9 May 1921 Nathaniel Gardner [son of Leopold Gartner & Fannie Edelstein] & Helen F. Coyle [daughter of Michael Coyle & Mary Josephine Mullane] Nathaniel and Helen were married twice, to each other. 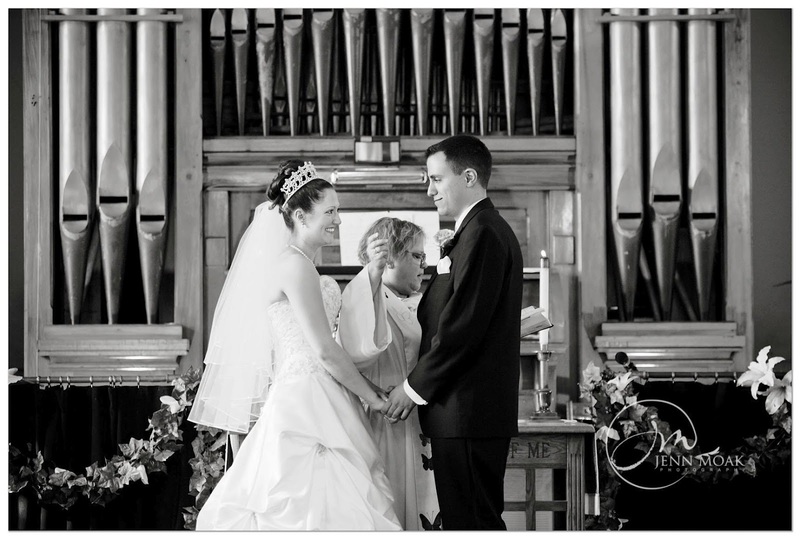 They were married in a civil ceremony in Manhattan, NY & later married in a Catholic ceremony. They had one daughter. Nathaniel & Helen were my maternal grandparents. 12 May 1716 Johan Jacob Wolf [son of Johannes Peter Wolf & Susanna] & Anna Barbara Orth. They were married in Germany. They had eleven children. Ten children were born in Germany. The youngest was born in Pennsylvania. 13 May 1920 Calogero Palilla [son of Dominick Palilla & Carmella Comparetto] & Grazia Brigandi [daughter of Carmen Brigandi & Angela Valenti]. They were married in Connecticut. They had four children.